The Genesis GMT15A Multipurpose Oscillating Tool is an all-around power device with various attachments for an array of home improvement and repair tasks.Reaching up to 21,000 oscillations per minute (OPM), the Genesis GMT15A Multipurpose Oscillating Tool combines power with precision for jobs both large and small.Any Genesis GMT15A review must acknowledge that the tool has a large fan base. Grinding, cutting, sawing, sanding and scraping are all made easier by its powerful motor and four-pin flange. Whether the objective is repair, construction or enhancement, this instrument proves handy and dependable. 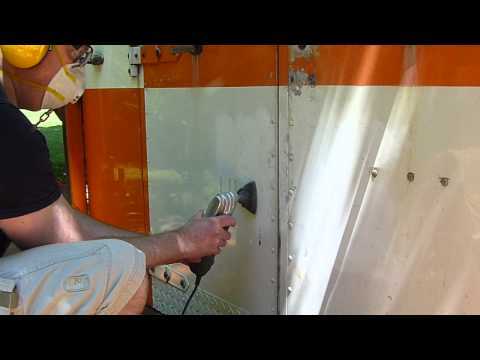 Video: a man using Genesis GMT15A multi-tool to remove old decal glue on the back of his truck. Less expensive than most of its competitors, the GMT15A nonetheless achieves a maximum speed of 21,000 oscillations per minute (OPMs), allowing it sufficient speed for stubborn challenges like sanding, scraping and grouting. The two-year warranty includes an added benefit of access to the Genesis technical support department. Although it is lightweight and easy to maneuver, the GMT15A gear is encased in durable die cast aluminum for optimal protection against damage and the elements. This tool bears the ELT designation, meaning it was tested by an independent and objective laboratory for both efficacy and safety. The device has few critics overall. Critics do exist, however. Most are frustrated that the Genesis GMT15A Multipurpose Oscillating Tool does not adapt to attachments from other toolmakers. By itself, this is not a huge problem. However, the fact that the Genesis blades are not an easy find at the big box hardware outlets makes replacement more difficult. If this tool becomes indispensable to those who make their living by rehabilitating houses, it is definitely worth the low price for the DIY homeowner. The issue of obtaining and paying for new blades is a drawback, but not enough of one to prohibit the purchase of this versatile instrument. In a scale of 0.0 to 5.0, the GMT15A receives a 4.5 which earns it a place among our top 2015 oscillating tool reviews.